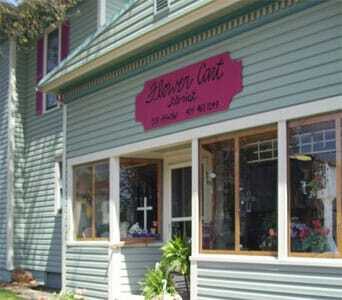 Flower Cart Florist is proudly serving Galion. We are family owned and operated. Our top designer is on the Teleflora Buckeye Board. We are committed to offering only the finest floral arrangements and gifts, backed by service that is friendly and prompt. Because all of our customers are important, our professional staff is dedicated to making your experience a pleasant one. That is why we always go the extra mile to make your floral gift perfect. We take pride in being VOTED "Best of the Best" Flower shop in this area. Call Direct for specials at (800)795-7158. *Our shop is open from 9:00 a.m. to 5:00 p.m., Monday, Tuesday, Thursday and Friday: Wednesday 9:00 am to 1:00 pm EXCEPT VALENTINES DAY! We are OPEN all day !!! From 9:00 a.m. to 12:00 p.m. on Saturday. Sunday deliveries may be available with prior notification. We have a 24 hour answering machine including a phone number for funeral emergencies, including Sundays. All after hours calls can be left on our recorder and we will be checking those on a frequent basis and be returning all calls. Summer Hours: Saturday 9 a.m. to 12 p.m.
Our shop serves the following areas: Crestline, Iberia, North Robinson, Leesville and Bucyrus. If you have any questions or need more information, please call us directly at (800)795-7158. We're always here to serve you and make your flower-sending experience a pleasure. We will deliver on Sunday if requested prior to the date. We will deliver to Fairview Cemetery with proper information.